There’s been a literal deluge of pies around the blogosphere lately. Have you noticed? Everywhere I look I am tempted by the flaky crusts, fruity fillings and creamy toppings that are coming out of kitchens from coast to coast. It’s a wonderful thing. One scroll through my friend Cheryl’s ‘Love the Pie‘ link up from last week will make your head spin; nearly one-hundred and seventy scrumptious pies are represented. That’s a lot of pie love. Here at Simple Bites, we’ve contributed our fair share of seasonal pies this fall – and we haven’t stopped yet. In fact, I’ve been saving the best for last. Today’s Cranberry-Orange Pie with Cornmeal Brown Sugar Streusel is easily the best pie I’ve eaten all year. I should follow the bold statement above with the disclosure that fruit pies hold a special place in my heart and always have. I don’t gravitate toward the coconut creams or peanut butter extravaganzas, just give me a simple plum tart or something of the sort and I’m happiest. Fruit pies have a beautiful way of following the seasons. Tangy strawberry-rhubarb leads the way in spring, sultry peach follows during the hot summer months, and autumn brings an array of pumpkin, sweet potato, apple and pear. Fresh, whole, local cranberries are available at my grocery store and local markets from October through January, making them an ideal fruit to capitalize on when all other berries are expensive and imported. Marry your cranberries with pears and stew them into a compote, simmer them into a sauce for your Christmas dinner, but please, I insist: be sure to try them in this pie recipe. Since my pre-teen years of pie making, I've adapted my cranberry pie to feature a streusel topping instead of a lattice crust. I'm smitten with the rustic slightly crunchy cornmeal streusel and it's so simple to pull together and garnish the pie. I probably don't have to tell you, but this tangy pie is best enjoyed with a scoop of vanilla ice cream. In a large bowl, toss cranberries with orange zest, orange juice, sugar and melted butter. Pour into pie shell. In a food processor, combine flour, cornmeal, brown sugar and butter. Pulse for a minute or so until combined. 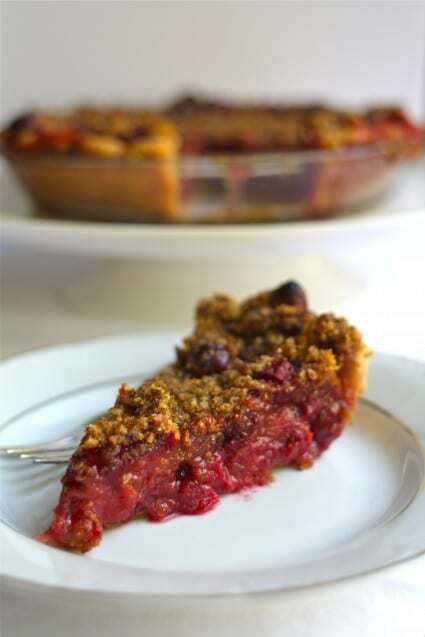 Scatter cornmeal streusel evenly over the top of the cranberry pie filling. Place pie on a baking sheet (to catch any drips) and place on the middle shelf of the oven. Bake for about 40 minutes or until the pie is bubbling around the edges and the topping is a dark golden brown. 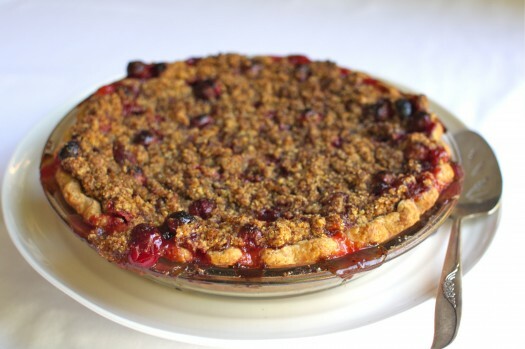 Remove cranberry pie from the oven and allow to cool to room temperature before serving. What is your favorite flavor of fruit pie? This looks wonderful! I definitely want to give this a try. I agree that cranberries and orange are a match made in heaven. Love the tart-sweet combo and I’m intrigued by the cornmeal crunch topping – great idea. Thank you for the recipe! My favorite pie is a pumpkin praline pie. Pumpkin pie is great, but when topped with pecans & brown sugar it is even better. My favorite fruit pie is a pear cranberry pie. I’m a sucker for anything cranberry, so the recipe above really speaks my language! Yummy! While I have to be honest and say Nan’s Kahlua and Lemon Meringue hold very special spots in my heart, this pie is really tugging at the heart (and stomach) strings too! Blackberry pie is my ultimate fruit pie though. Nan grew them, and we got maybe one pie a year, plus a few hand pies. Her blackberry pie was spectacular with a little vanilla bean ice cream on top. I can taste it now! Favorite pie = fruit, all flavors. I have a bag of frozen cranberries – will that work for this recipe? Definitely want to try it. I think so, Steph, although you might want to add a teaspoon or so of cornstarch to the pie filling. Thanks! I’ll keep that in mind! Oh. My. HEAVENS! That looks fabulous. I love cranberries passionately. Definitely making this one! Fruit pies are always at the top of my pie love list! this one sounds amazing Aimee!! Hello, yummy! Cranberries are actually one of my favourite fruits, so this is a definite must-make for me. I’m gonna need to make this recipe soon! Cranberry+orange combination sounds quite interesting! The color of that pie is absolutely gorgeous. Love cranberries, so I’d love this pie! Yum! Yum – what a great combo! must make!! I am not sure if I have ever made a pie. One day I think I will try and this one would be a good one. Not having a top crust looks easier! I made this pie for Thanksgiving and the taste was INCREDIBLE. I think I will try a different top crust, though; I used polenta, which I think is too grainy (at least the brand I bought), whereas corn meal would have had a finer texture. I may try it with that lattice crust, that would look superb. Either way, the taste of this pie will make it a regular at holiday time. Thanks Aimee! Made this pie at Thanksgiving and it got rave reviews, so I’m making it again today for Christmas! 🙂 Thanks for the great recipe! Easiest pie to make! Smells and looks delicious, making it ahead to serve on Christmas day dinner. As per Aimee’s suggestion, will be reheating in oven 10 min prior to serving it to get a crispy topping! Loved this pie. I almost at the whole thing by myself and I would have except my sister and nephew thought they needed to try it also. Add more cranberries(I halve my cranberries when baking, too)…. mix in a tablespoon of flour into the topping and a half cup of chopped walnuts…you won’t be sorry.